Originating from the Wild Rose Bush, scientists and harvesters of the Rosehip plants have noticed the oil extracted is unusually high in vitamins, anti-oxidants and essential fatty acids. Contributing many wellbeing benefits, especially to the skin and hair! As it is certified organic, the unique extraction method used guarantees the purest and most potent oil, leaving your skin glowing and luminous. 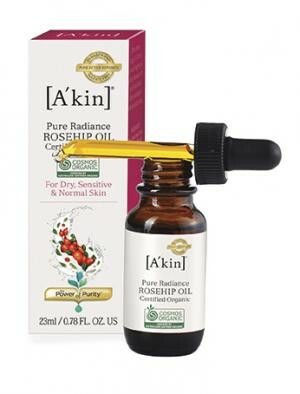 Discover skin that feels soft, smooth and deeply hydrated with A'kin Pure Radiance Rosehip Oil. Enriched with pure active botanics like certified organic rosehip oil extracted from rosehip seeds, it has a high concentration of Vitamins A and E and Omegas 9, 3 and 6 essential fatty acids. 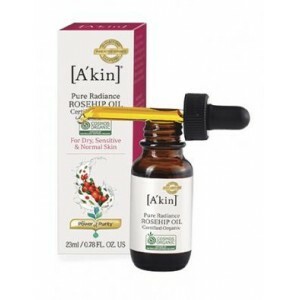 [A'kin] Pure Radiance Rosehip Oil has a concentration of Omega essential fatty acids that is no less than 80%! Handy for all the family and can treat dry skin conditions such as Psoriasis and Eczema, to chapped lips and broken skin. A must have for any family remedy cabinet! 100% organic Rosa Canina Seed Extract, Rosmarinus Officinalis (Rosemary) Leaf Extract.